Most of the above will probably still happen, especially the 1800s pumpkin pie, but I ran each one by Nathan and at most, he raised an eyebrow out of curiosity (I believe that was the pumpkin pretzels). It wasn’t until I said gingerbread cake with pumpkin cream cheese frosting that he finally said “Oh yes,” which is about as excited as he ever gets. I was a little scared to let Nathan taste test this cake because last time, when I made it as a persimmon upside down cake, his lip swelled up after one bite. At the time, I was convinced he was lying, that he was secretly on a diet and didn’t want to eat any sugar, but I googled persimmon allergy and it is apparently a thing. He did say the texture of that cake was very good. This time, I tentatively offered a slice of cake, and to my surprise, he said he would risk it. “This is very excellent cake,” he said. Wow! That’s a lot of praise coming from Nathan, owner of four waffle irons. We waited five minutes. His lip did not swell up. Phew. 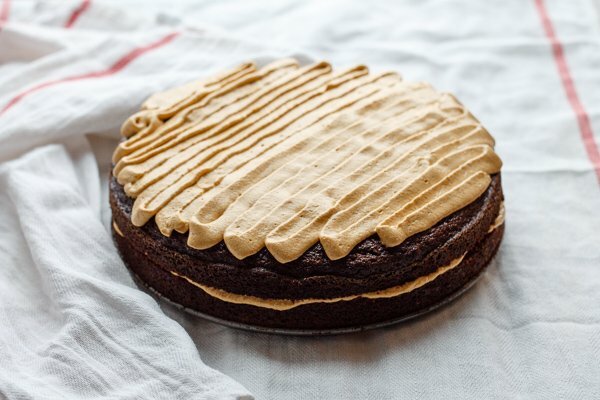 This is one deeply spiced, dark molasses gingerbread. Ginger is definitely the star here. I never understand when a gingerbread recipe calls for more cinnamon than ginger. It’s not cinnamonbread, hello. It’s gingerbread. There’s also other good stuff in here, like 3 apples! 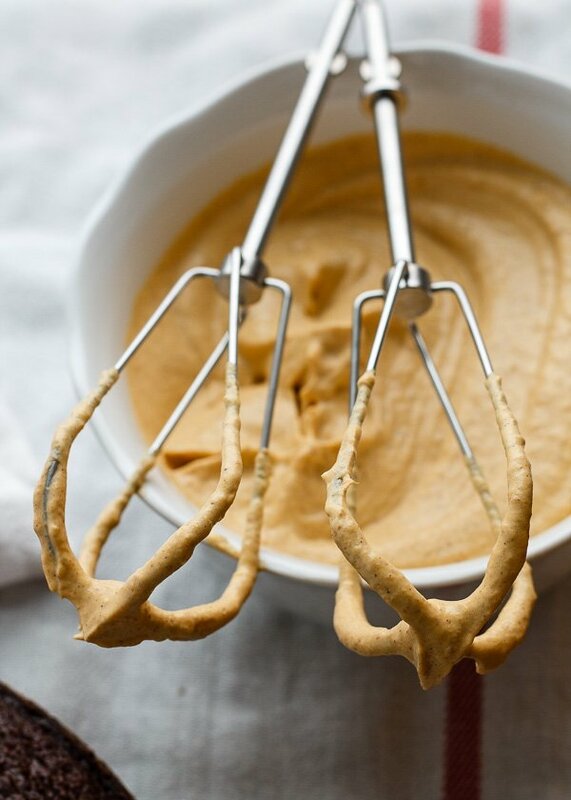 On to the pumpkin cream cheese frosting now – it is pumpkin pie spiced, takes only a few minutes to whip up, and is almost healthy, cause I made it with Greek yogurt cream cheese, my newest discovery. It’s got 4 times the protein and half the fat. You can of course use the original, or Neufchâtel cheese, but this Greek yogurt stuff really does taste like cream cheese, so why not give it a try? I had quite the internal struggle calling this “frosting.” Frosting is my nemesis. I buy things with frosting and then scrape it off. I might as well just flush dollar bills down the toilet. But anyway, I am not a fan. I love whipped cream, ganache, whipped ganache, and syrup, but I hate frosting. So I tried out other words on Nathan. Pumpkin cream cheese whip? Meh. Whipped topping? No, that might be mistaken for Cool Whip. Fluff? Once again, marshmallows took that one. Spread? “SPREAD? !” Ok, definitely not spread. In the end, I just have to call it frosting, but of a creamy, light, and luscious variety. 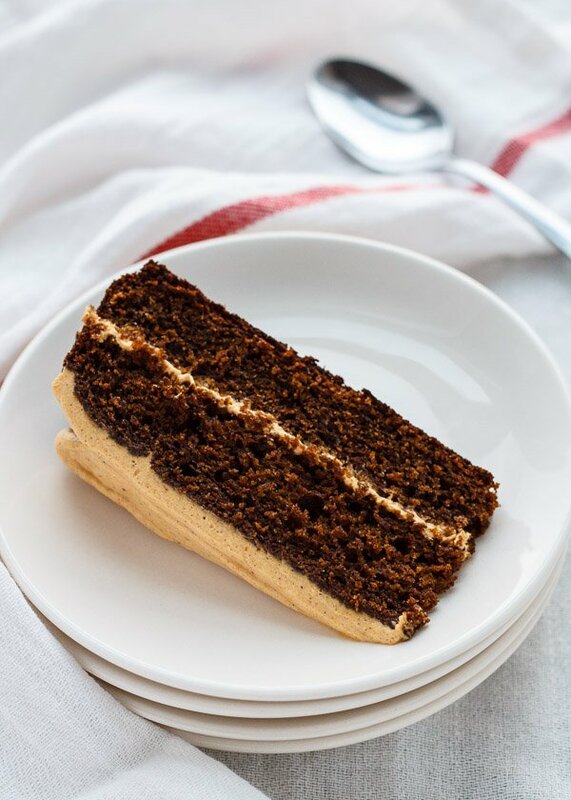 It imparts moisture to the gingerbread layers and seeps into the crumb, making this cake even better the next day. 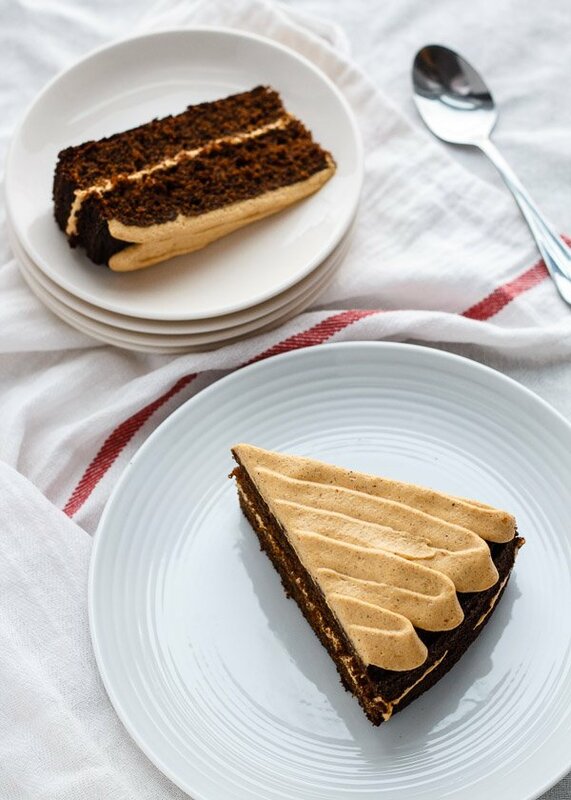 In fact, for a more decadent cake, I wholeheartedly encourage doubling the frosting recipe and piling it on, especially if you are like me and swipe several spoonfuls while frosting your cake. 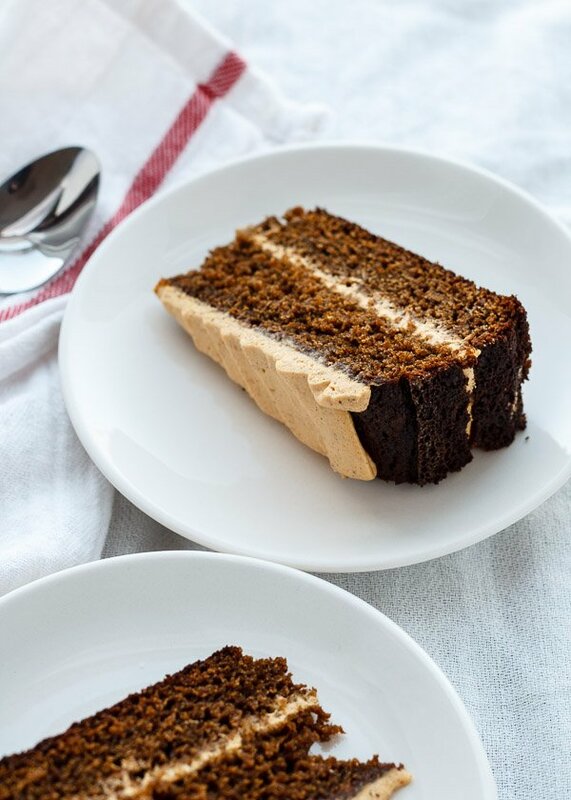 Now I must hurry and finish writing this post because my friend Cindy is shouting “CAKE CAKE CAKE” over the interwebs at me. I think she wants the recipe. This cake is better overnight, as the spices will have time to bloom. Keep it refrigerated, then bring it back to room temperature (about 30 minutes) before serving. 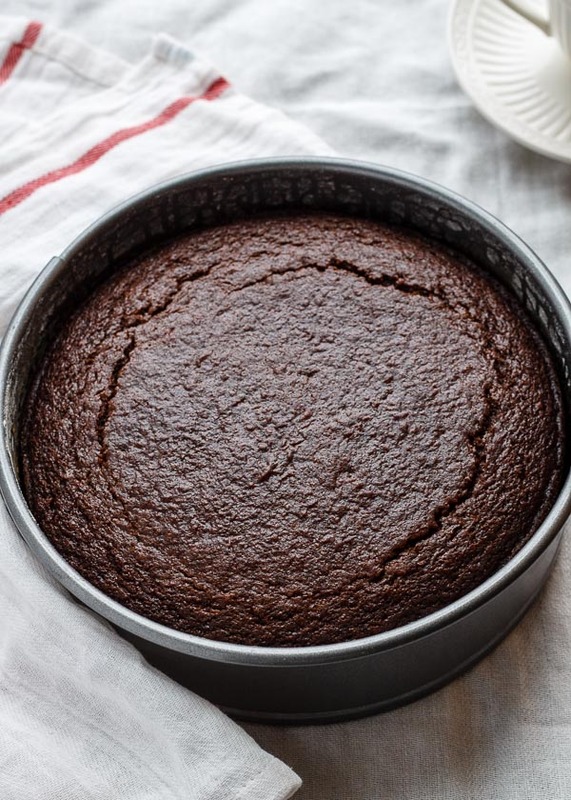 If you don't have cake flour, you can use all-purpose flour. Cake flour just makes the crumb extremely tender. 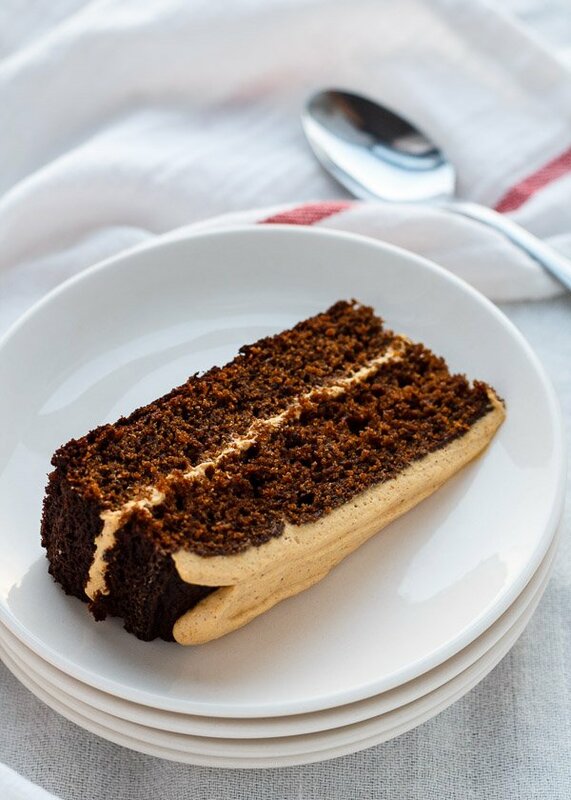 You can also substitute regular, light, or Neufchâtel cream cheese in the frosting. I tested this recipe with butter, oil, and a butter + oil combo. Oil works best. Preheat oven to 350°F. Grease and flour a 9-inch round springform pan. In a large bowl, whisk flour with baking powder, ginger, cinnamon, nutmeg, cloves, and salt. In a separate bowl, mix applesauce or apple puree with baking soda. In a third, large bowl, beat eggs, molasses, brown sugar, and oil until smooth. Add to dry ingredients and gently stir to form a smooth batter. Fold in applesauce mixture. Pour batter into pan and bake in center of oven for 40-45 minutes (a toothpick inserted in middle of gingerbread should come out clean). Cool 5 minutes in pan on wire rack, then unmold to cool completely. Mix pumpkin puree with the spices and sugar, then beat in softened cream cheese until smooth and fluffy. Keep refrigerated if not using immediately. Slice the gingerbread into two layers (I used a wire slicer from IKEA). Spread or pipe the frosting over both layers, then stack them. Refrigerate until ready to serve. Bring the cake back to room temperature (for 30 minutes), then serve. Gingerbread recipe adapted from Classic Gingerbread. Lu! I made this cake for my family and they loved it! The only substitutions I made were 1 c. fresh pureed pumpkin instead of apple, and minced fresh ginger instead of ground ginger. Then we had a power outage when the cake was in the oven, so I was worried it would be underdone, but I just left it in until the oven cooled and the cake came out moist and delicious. The cream cheese icing (I made it with Neufchatel because I couldn’t find the Greek yogurt stuff) was to die for. We ate it by candlelight because the power didn’t come on till this morning! You’re missing all the snow, btw!!! Marnie that is the best story ever! Awesome that you made the cake with pumpkin puree – now I can add that as a substitution in the recipe notes 🙂 Happy Thanksgiving from China!! This looks fantastic!! I have to make a dessert for a potluck this weekend, and this will be perfect – thanks for the recipe! Also, pumpkin mac and cheese is definitely worth making…my boyfriend gobbled it all up so quickly I hardly got any myself. Yay! Let me know how you like it 😛 I’ll definitely be making your pumpkin mac and cheese.